A new software update is now available! This software update addresses a bug introduced with the previous release 2 days ago and expereinced only by some of you. In some tracking we have seen sudden jumps to the equators: now the issue should be fixed. We are looking forward to hear your comments. No jumps to the Equator, however during my run the watch froze at around .6 miles. I had to powercycle the watch and it didn't happen after that. A bit disappointed after 1.8.23 and 1 run. - Number of satellites was 5-7 during the whole run. There is a problem I've noticed while the watch is stopped during a workout. It adds time to the average pace per mile(or km). For instance I just got back from a run where I stopped between mile 2 and 3 to chat with a friend. My pace, while paused, went from 7:12 to 9:30 about. Display from watch. Where you can see the Total time and distance does not match the pace. It reads 6.9mph at 8:45 pace when in fact endomondo reads 7:24 pace. Also, the KCals is still way too high, whatever formula is being used is off by a factor of at least 2. Much better than before though. A tough run today and it is all good news. I run around Umstead Park - a local park with trails that are both and sheltered to the skies. Auto Lap was on (1mile) and I had my HRM on too. It was a 3h:12m run and the Leikr had 1 bar of battery left. Distances were 24.98 (Leikr) and 24.69 (Garmin 910XT). 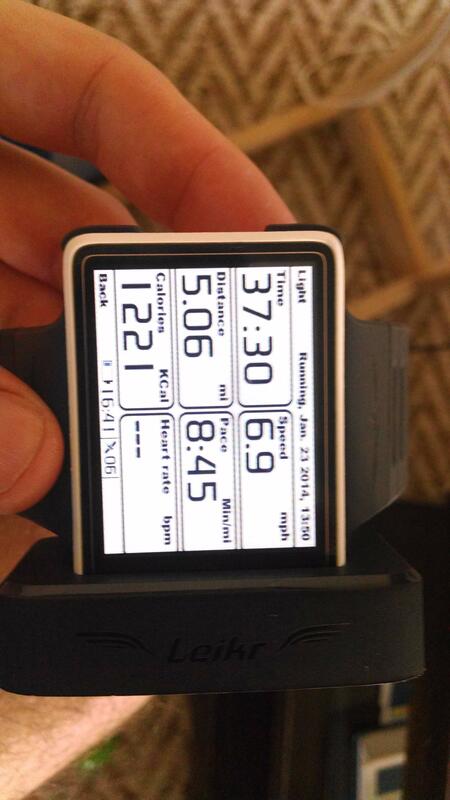 The Leikr post almost 400 kcal compared to the Garmin. The elevation plot from the Leikr is not representative - this was a very hilly run. Today I ran a 15K road race, or 9.32 mile road race. The course was measured accurately and marked accurately. The Leikr watch was almost 100% accurate. I was extremely impressed. I forgot to stop the watch as I crossed the finish line so there is a little extra data (about 20 seconds worth) after the 9.32 km. I used the wrong link, ignore that last one. Not sure if that is connected with the latest software release but it happened now for the first time. At one point, the watch had a huge delay when I was pressing any of the buttons. For example, one press on the light button and around 30 seconds later it vibrated and the backlight came on. Same happened with all other buttons. During that time, the kilometer I ran so far changed. I was at 8.7 km and suddenly it showed 8.2 km and again later 8.7. It was like my laptop when the virus scanner is on, everything is delayed. It happened at the end of my run and now after a switch off/on it worked normal again. however, my track on endomodo looks strange. Whereas the total kilometer are correct, the map and the heartbeat monitor only shows a little more than 1 kilometer total distance.